Like everyone else, I have my favorite stops at market. No surprise that my bestest, most favorite stops are to my best quilt designer friends booths. Three guesses who's booth this is! Haha. Yes, folks, it's Kansas Troubles Quilters by none other than my BFF, Lynne Hagmeier, accompanied by husband Robert. I sat in a chair across from them, really meaning to chat, you see, however, my eyes couldn't help but ignore them to look around the booth at all of the quilts. I think they'll forgive me....it was Quilt Market after all!! The glorious quilt behind Lynne and Robert (and most around the booth) were made of Lynne's new yet-to-be-released fabric line called Harvest Moon. Friends.....start saving your pennies because this collection is over-the-moon wonderful! 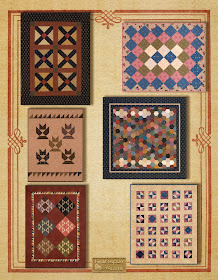 Lynne's booth was jammed with new quilt patterns, Table Treats patterns, Stash Society goodies, and a sneak peek at some projects that will be in her new book coming out later this summer! Love, love, love them! I've been a huge fan of Kansas Troubles since the day I began piecing my first quilt. Love those colors...they're everywhere in my home. Notice something that just doesn't seem to belong? Lynne used my new fabric, Heart of the Prairie, in her new Table Treats design called Spell It Out. The pink one is made from some of my fabrics. Did I worry you? Nah...Lynne's not gonna go pink, that's for sure. She just surprised me with that quilt. I think the Spell It Out Table Treats are way cool and will be loads of fun to make for any special occasion or holiday! Hey, Lynne....my birthday's coming up....hint, hint. Teehee! Oh, and by the way, Lynne and I have been working closely with Bunny, our cruise and retreat planner, on our new 2013 Great Girlfriend Get-Aways!! We've got two terrific destinations to offer you. The news will be coming soon, so stay tuned!! Next stop.....to the booth right next door to me.....and my dear, dear friend Tara Lynn Darr of Sew Unique Creations. As you know from previous posts, Tara and I traveled to Kansas City together. What a blast! The fun lasted the entire week. Well, enough about that....you wanna see her booth and quilts, don't ya! Tara out did herself, releasing 22 new patterns! Oy, Vey!! Tara, did you sleep? 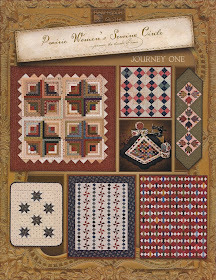 Many of her new patterns featured wool applique, and are they stunning! I told her she was born to create those quilts. I wish I could draw appliques like this!! Did I lie? Aren't they just awesome? 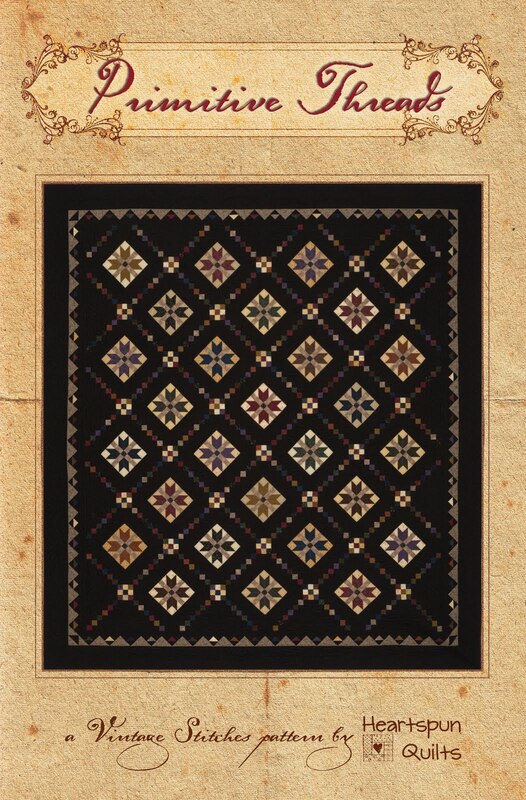 Isn't there something wonderful about the combination of the wool, the pieced blocks and borders, and then the addition of the quilting stitches. The blending of textures is just glorious! Well, Blogger is just taking forever. It doesn't like it when I add so many pictures to one post, so I'll have to quit for now, but rest assured, I have lots and lots more photos of country, folk art, and primitive booths from my favorite designers. Next up will be the quilt that stopped me dead in my tracks! Really!! Thanks for visiting with me today!! Upon arrival at Quilt Market, everyone starts with a bare-bones booth. White drapes, steel poles, boxes and displays are what each of us are challenged with. Our mission is to turn this drab plain canvas into something wonderful to best show off our newest designs. How each person is given the same empty booth, and turns it into something different and wonderful, is just amazing! Marcus Brothers Fabrics was just across the aisle from me, only their challenge was their booth was four times larger than mine! After two days of work... arranging, hanging & pinning, it was ready for Friday's opening. Here's how my booth looked Friday morning. I was happy with the way it turned out. It felt like me and hoped it displayed my new quilts in a warm, inviting setting. Across the aisle at Marcus Bros, they displayed the freebie pattern that showcases my new fabric line, Heart of the Prairie. Everything looked great, don't ya think? 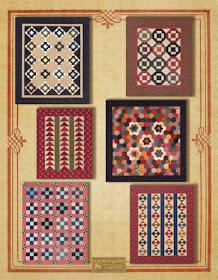 The black and colored solid quilt at the far end of the booth is called Amish with a Twist, and was designed by Nancy Rink. It's just stunning! Speaking of Nancy Rink (left), she and pal Mary (right) had a booth across the aisle from Marcus as well. Nancy's has a brand new book called The Mill Girls. I did a story about the mill girls of Lowell, MA for the Prairie Women's Sewing Circle club, and I can't wait to read a lot more in Nancy's new book. The story is quite compelling! 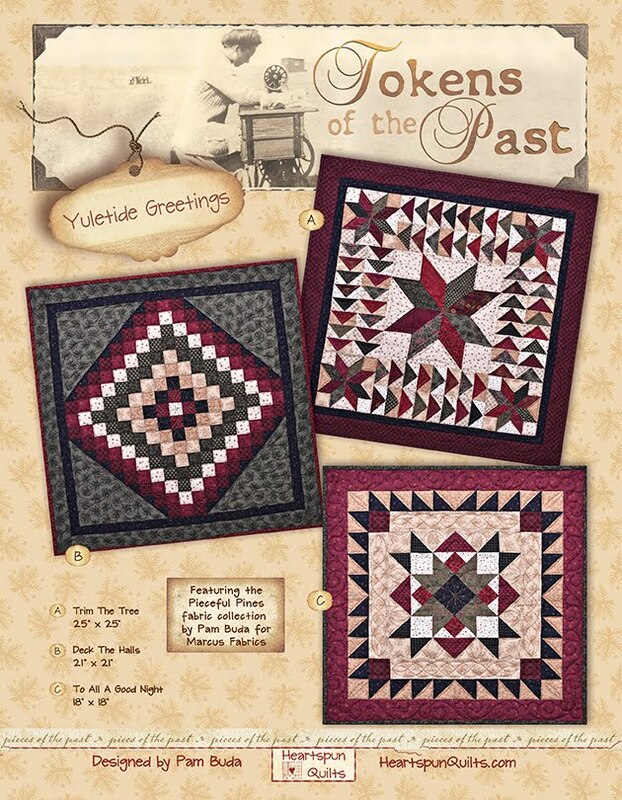 The large quilt with the big red star features fabrics from The Mill Girls collection, designed by Judie Rothermel (Marcus) for Nancy's new BOM!! Check out the details by clicking here. More about the Kansas City market in my next post! Back From Market in Kansas City!! I'm so sorry that it's been a long, long time since I've posted on my blog. I had high hopes of being able to keep up while I was at market, but there was just no chance. My good intentions hit a bump the first day out because of poor internet connections, and that, along with a very full schedule, busy market, and a fun three days with the staff of American Patchwork & Quilting magazine left nary a second to do any blogging. However.......I took loads and loads of photos to share with you once I returned home! I'll bet you've been seeing lots of pictures of market from other designers, and I'm hoping that I have some that maybe you haven't seen. It will take several posts to be able to show them all, so let's get started....from the very beginning. My pal, Tara Lynn Darr (Sew Unique Creations) and I left early the Monday morning before market. It felt soooo good to have the trailer packed and hit the open road. We drove to Columbia, MO where we stayed the night, and visited a terrific antique mall called Artichoke Annies. BFF, Lynne Hagmeier (Kansas Troubles Quilters) always stops at Artichoke Annie's when she's passing through, so we knew we just had to stop to check it out. You see....what made it so exciting with possibilities is that I never, ever get to go antiquing with a trailer hitched to the car. And...there was some room in that trailer, too! Alas....while Annie's was full of wonderful goodies, I didn't buy anything needing a trailer. Bummer! 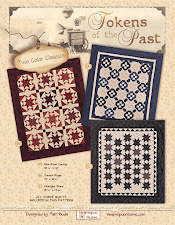 I did purchase a lovely stack of antique quilt blocks that held beautiful fabrics for my future lines! A nice little treasure! Wednesday morning for the start of set-up. Set-up begins with my next post in a day or so. Stay tuned! Homestead Hearth Quilt Shop in Mexico, Mo. They have tons of fabric - all different genres. Tara had never been, and since it was on our way, well we just had to go. Yes, we both found a few treasures to add to our stash. Next stop was to a great antiques' mall just outside of Columbia, Mo, called Artichoke Annie's. They sure have some great displays....don't ya think?? I found a huge pile of awesome quilt blocks that will be great inspirations for future fabric lines! Wonderful first day as we make our way to KC. Feels so good to be out of the office. More tomorrow! So far blogging with my iPad is working pretty well. The boxes are packed, quilts completed, patterns stuffed, and the brochures are all done. My very long To-Do list has been whittled down to just one page! Crossing things off feels oh-so-good!! Yesterday, I delivered almost all of the stuff for my booth to my traveling pal and fellow designer, Tara Darr's trailer. We were both giddy that we're finally at this stage! Pack and load.....has a different meaning for quilters....teehee! I'm shutting my office down for two weeks! I wanted to leave you with a few more new quilt photos. They aren't up on the website just yet, but will be shortly after I return. fabric line. It features most of the prints from the collection. I was inspired by an antique quilt that my dear friend Docia owns (she's the owner of my favorite local shop The Quilt Merchant). Docia allowed me to replicate her quilt, and I think it turned out great! Lovin' those Indigo blues, pinks and greens together. It's everything I was hoping for when I designed the collection. this is the project we will be making!! All kitted with fabrics from Heart of the Prairie! That is why I was unable to show you my Alaskan cruise project until now! I couldn't talk about it then! Hope you forgive me!! Prairie Women's Sewing Circle club! You asked for a quilt featuring schoolhouse blocks and you got it!! 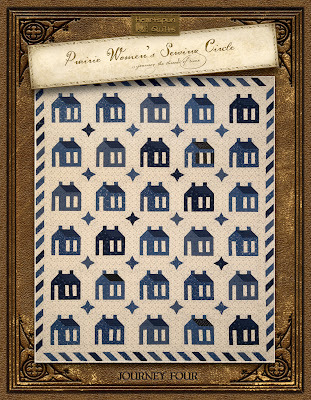 This quilt, called Ye Olde Schoolhouse, uses one background print and 6 Indigo blue prints from Heart of the Prairie. The schoolhouse block is very easy to piece with no dreaded "Y" seams! There will be a smaller version of this quilt offered to club members as well. I return from market. Hopefully, this will hold you over. so you can come along, too! Whether I'm successful or not depends on my Wi-Fi connections. So, please stay tuned to my blog and Facebook page. I hope to send you lots of news and images from Kansas City! To all of my blog readers around the world.....I wish you all a Happy Mother's Day!! My thanks to everyone who participated in my very first Pocket Patchwork Sew-along! The response was overwhelmingly wonderful! I know that many of you haven't been able to sew-along with us these past few weeks, but that's quite alright. Read on for a reason to get started! This book is one of my all time favorites. I page thru it regularly and am inspired by the lovely things on its pages. One page in particular really caught my eye this spring, and was the catalyst for two of my most recent designs, with the Busy Work quilt being one of them. 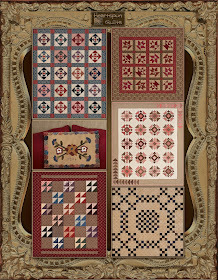 Lucy's Prairie Pockets pattern was inspired by the Prairie Pocket hanging on the wall. I had been wanting to create a pocket for some time, and it just kept nudging me. I'm so glad that I did because they are really great fun to make. Doesn't it look awesome in this arrangement? Pockets look great next to the reproduction quilts in my house, too. Loving all those needle-keep cases and wonderful antique quilts. Sigh. There are many goodies on this page that I'd love to reproduce in some fashion or form. You, too? Well, Busy Work was inspired by the little black, brown, and cream colored two-block Sawtooth Star quilt to the lower right corner of the pocket. Two blocks doesn't make for a long sew-along, so I played with ideas until I came up with what you now know is Busy Work. So, that's how Busy Work came to be! What do you think? Now...on to the important stuff. Choosing the winners! Yes.... winners - plural. I decided to choose two winners....so each will get a set of my newest 6 patterns. Jan who said....It's been so much fun waiting for Friday to see the next piece of the quilt. I love the finished quilt. I did mine in the same color way as yours and I'm going to quilt it with an overall design using my embroidery machine. Thanks for a great project!! Marcia who said.....This little quilt is adorable. 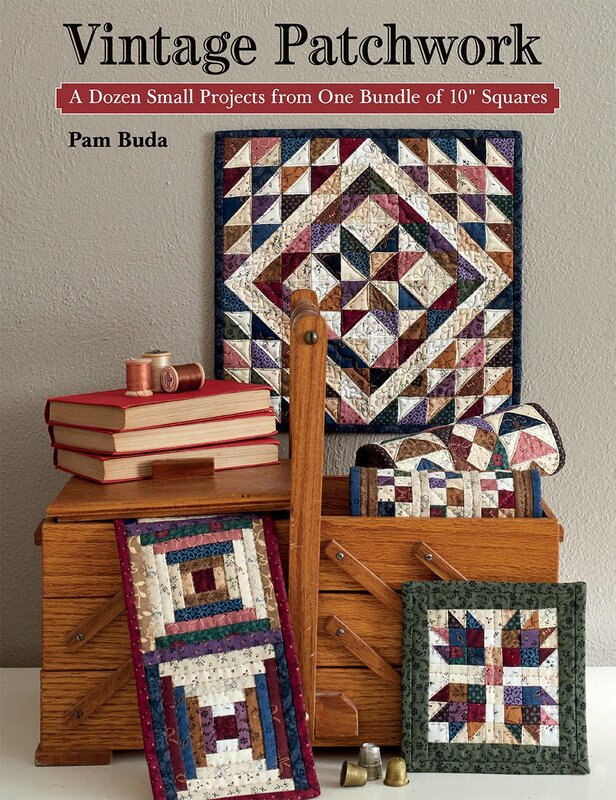 I am just getting into mini quilts as I begin my retirement. Mine is not ready to send a photo yet, but I have the fabrics ready to go and have started cutting. The border really adds a great finishing touch. You fabric line is lovely. I look forward to buying and using it - maybe with your patterns. 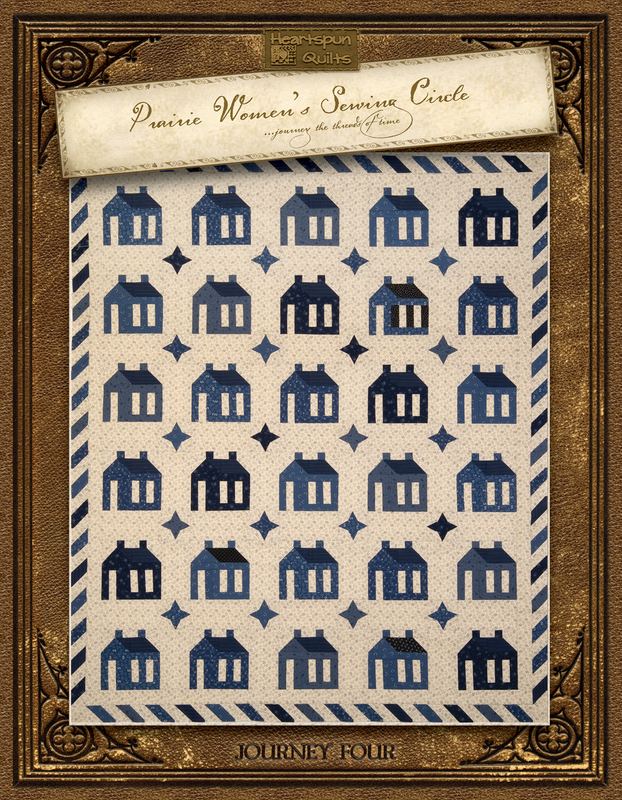 Please email me your snail mail addresses and I will get those patterns to you right away! Thanks to everyone who commented all along. Words don't fully express how I love reading them and that they mean so very much to me. I'm loving all of the colorways that you are all using. I've seen quite a few and they're great. Thanks for the photos and links!! Now, I know everyone would enjoy seeing how your Busy Work quilts are turning out, so I'm going to propose another give-away!!! If you have it quilted and bound, why, we'll consider you an over-achiever! Send me a photo of your quilt via email no later than July 7th to be eligible, and I will show them all in an upcoming blog post! Your photo will count as your entry to the give-away. So, ladies and gentlemen......start your sewing machines! I've got to get back to market preparations. Enjoy your day and I'll be in touch very soon! 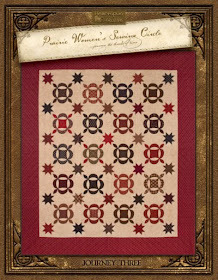 I'm very proud to announce that another new spring pattern, American Gothic, is all done. "the more fabrics ~ the better", this is the quilt for you! 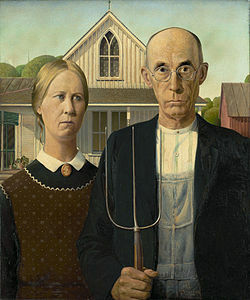 American Gothic features a very old, traditional block called the Cross X block. It has long been a favorite of mine and I've been anxious to use it in a pattern. I love the simplicity of the block design, and how it allows for a fun mix of fabrics, which then makes for a very striking quilt! 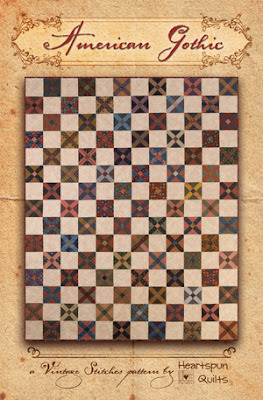 The pattern uses either Fat Eighths or Fat Quarters to create the colorful mix of Cross X Blocks. 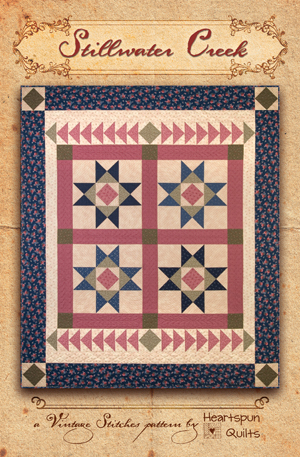 I set the blocks with a wonderful old "Prairie Dirty" black shirting from my Heart of the Prairie fabric collection, (Marcus Brothers Fabrics) to complete the vintage look! 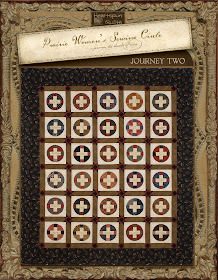 While the quilt looks to be scrappy all over, there is a hidden color theme in the quilt. Notice that in the diagonal rows (photo above), there's a row of green blocks, red blocks, and blue blocks. The triangles denote the color of the block. Just a little surprise to catch your attention as you take in the quilt. or paper pieced, if you prefer. As for the name....we're all familiar with the American Gothic painting, featuring the man (with his pitchfork) and the woman standing in front of the house with the gothic window. A bit of fun history reveals why the painter chose to feature an 1800's American couple living in a midwest prairie state as the subject of his painting. My pattern tells you more details about whom the man and woman were, and where the painting was created! Click here to order my American Gothic pattern and create an American classic of your very own! Thanks for stopping by to visit with me today! Quiltmaker's 100 Blocks Magazine Contest Winners! Bertiequilts ~ I absolutely love your fabrics... Heart of the Prairie. I know that when I see it in the stores, I will definitely be buying some for my projects. Kathy ~ Can't wait to see the new fabric in my local quilt shop! I just joined a Prairie Women's Sewing Circle and love, love, love it! Congratulations! 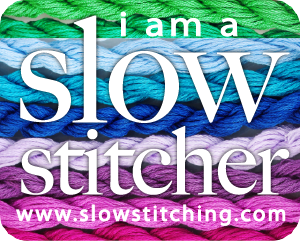 Please email your addresses to me, so I can get your copies to you, and you can start stitching! I'm in the last week of market preparations. Patterns are being printed, folded, and stuffed. Brochures are being assembled. Binding is being stitched and completed. Today, I'm going to set up my booth in the basement and decide what goodies I want to take for decoration. Then, it will be time to pack and load! Because of the help of my dear friends, I'm in good shape, and the stress level has been knocked down many notches! Where would I be without my family and girlfriends? Parish the thought! My heartfelt thanks and undying gratitude to my family, especially my daughter Nicki, who helped starch tons of fabric, and has stuffed thousands of patterns.....and to my girlfriends Lynn M, Debbie Mc, Ronda, and Sherry..for their hours of skillful stitching help and great company! This is an exciting time for all quilters. Quilt Market brings the creative forces of our industry together under one roof for a mind-blowing show. It's wonderful to see all of the new products, fabrics, and projects that will soon make their appearance at your local quilt shop. I'm always so jazzed to be able to see all of the quilts in person ~ there's just nothing like Quilt Market. And...one of the best parts for me is that I get to see many quilting friends again! It's our yearly reunion. There's always the bonus of making new friends, too! There are so many opportunities for you to come along to Quilt Market with us by following your favorite bloggers. 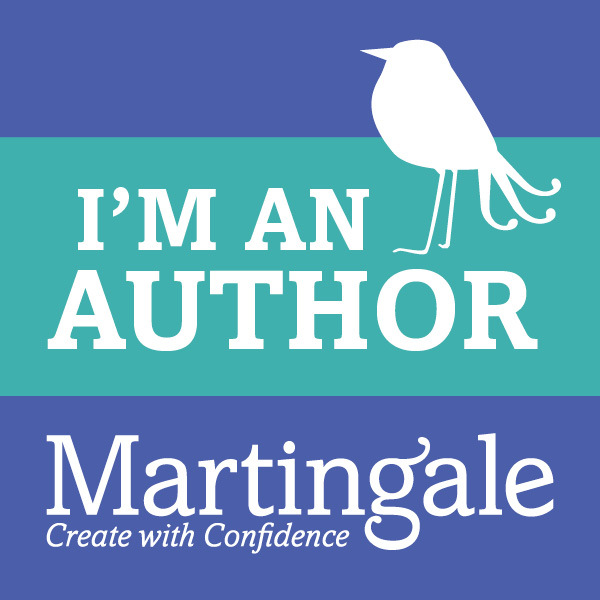 I will be doing my best to post from market, so...please stay tuned, and thank you for taking a few moments to visit with me today, too! Here is the sixth and final part of my very first Pocket Patchwork Sew-along! I can hardly believe that we're almost done! I have thoroughly enjoyed presenting this little project to you and have loved each and every comment. Enough about that - betcha want to get sewin'! Here's your cutting instructions. *Cut (4) 1½" black print squares for border. *Cut (4) 1½" brown print squares for cornerposts. *Cut (48) 1½" black print squares - cut in matching pairs - for FG Connector Corners (CC). Let's make some Flying Geese for a pieced border! *Draw a diagonal line on the wrong side of all (48) black print Flying Geese CC 1½" squares. *Place a black print CC to the left side of a light print 1½" x 2½" rectangle. Sew (scant) on the diagonal line; press and trim. Repeat on the right side. Make (24) FG that should measure 1½" x 2½" unfinished. *Arrange the units for the borders as shown. Sew together; press seams open. *Sew side borders to the quilt center; press to the quilt center. Sew top/bottom borders in the same manner. 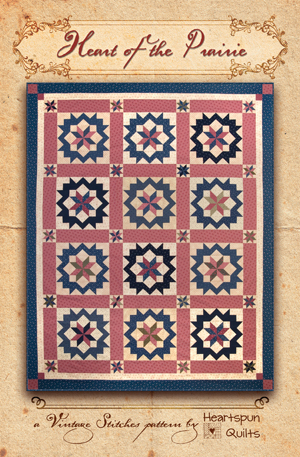 Your Busy Work quilt should measure 15½" x 15½" unfinished. Ta Da! What do you think? I just love this little quilt and it was very easy to put together. You know what we need next? A Give-Away! I'd love to hear what you thought about my first Pocket Patchwork Sew-Along. If you're making a Busy Work quilt for yourself, I'd love to know the colors you chose to use. Leave me a comment before midnight, May 6th, for a chance to win a set of my 6 new patterns! I'll also share where I got my inspiration for Busy Work. Thanks so much for sewing along with me. I had such fun, we'll have to do it again soon. Please spread the word among your quilting friends to become a follower of my blog and sign up for the posts to be delivered by email. The more the merrier! Thanks for spending a few moments with me today! I really appreciate it very much! Heartwarming (block # 450 on page 48) is constructed with easy piecing units! 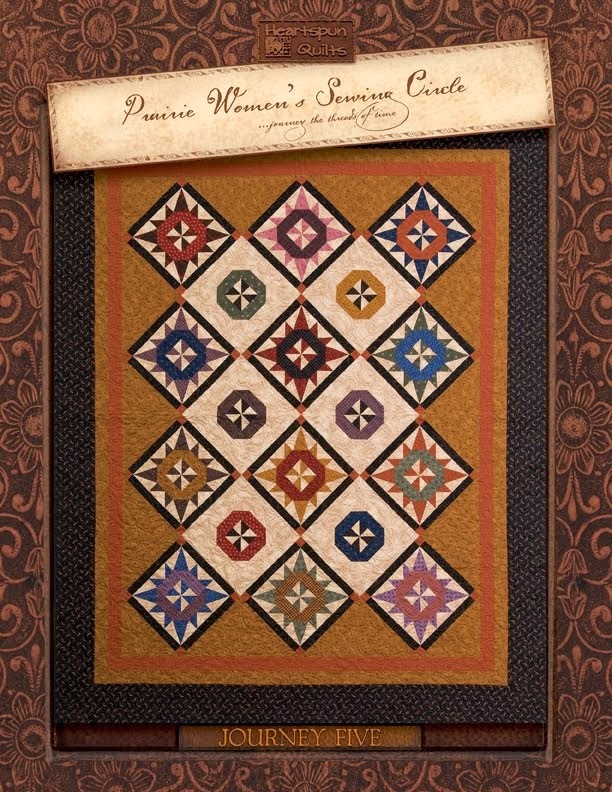 wonderful things to a block and your quilt, with all those showy angles. 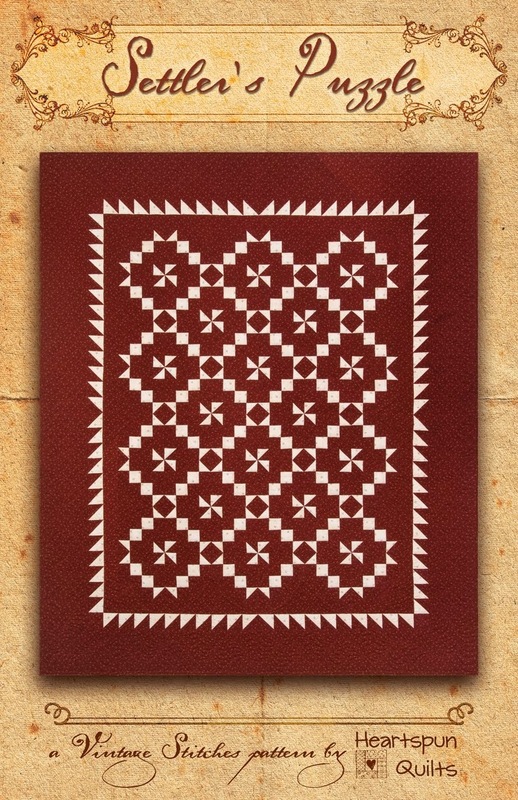 The center of the block is made from Half-Square triangles, and Flying Geese. Add in Half-Quarter Square triangles and a few Connector Corners and you've made Heartwarming! I thought perhaps you'd like to see what Heartwarming looks like in other fabrics. The sample above features several prints from my brand new fabric line, Heart of the Prairie! It's my very first fabric collection with Marcus Brothers fabrics!! Heart of the Prairie features Indigo blues, soft pinks, and a splash of greens. a daughter's dress, or window curtain. as nothing stayed white and clean on the Prairie! Click here to see the entire Heart of the Prairie collection. I thought you may also enjoy seeing what the Heartwarming blocks look like in a quilt made with some of the Heart of the Prairie fabrics. The Prairie Women's Sewing Circle club! 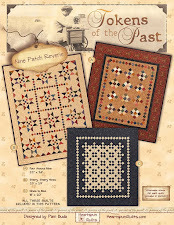 all that's new from Heartspun Quilts. Be sure to follow my blog and sign up to receive posts via email! and we're having a lot of fun with it. Scroll down to the next post to see what the little Busy Work quilt is looking like so far. enter your email in the "Follow by Email" icon, on the right side of my blog. 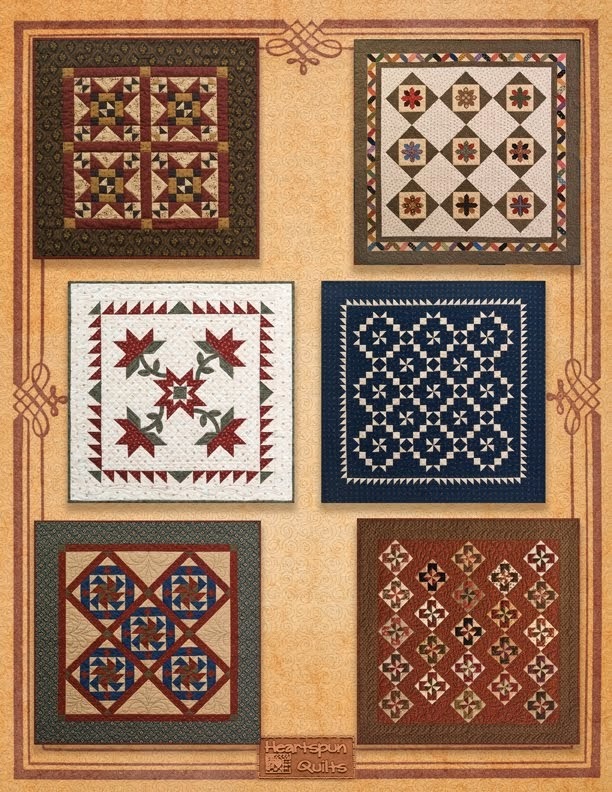 Quiltmaker's 100 Blocks by Today's Top Designers - Vol 5! by May 8th....so don't forget to pick up a copy or two!! 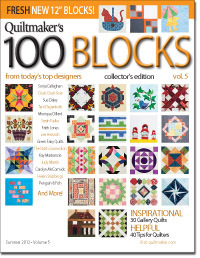 Quiltmaker's 100 Blocks magazine! Check back on Saturday, May 5th, to see if you've won!